The Mordecai house and grounds were once the seat of one of the largest plantations in Wake County, encompassing more than 5,000 acres. Today, the Mordecai House is one of the oldest residences in Raleigh and the oldest on its original foundation. The home was originally built in 1785 by Joel Lane but the house takes its name from Moses Mordecai, who twice married into the Lane family, first to daughter Margaret and after her death to her sister Ann. 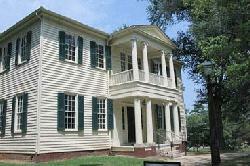 Before his death in 1824, Moses Mordecai hired William Nichols, then State Architect, to enlarge the original house. This addition is considered a significant work of Nichols and transformed the house into a Greek Revival mansion. The Mordecai"s were prominent in local and state affairs and their furnishings and affects remain on exhibit in the main house at the park. There are also several outbuildings that can be toured including a kitchen, law office, chapel, post office and the birthplace of Andrew Johnson, 17th President of the United States. Hours of Operation: Mordecai Historic Park is open for tours Tuesday through Saturday 10 AM - 4 PM and Sunday 1 PM - 4PM. Park grounds are open one hour after sun up and one hour before sunset every day. Call the park office for more information.